Skill-4-Life is an independent driving school with fully qualified driving instructors approved by the DSA providing driving lessons in and around the Watford, Harrow, Pinner and Rickmansworth areas. Driving lessons are always on a 1-to-1 basis. We offer a door to door service with pick-up from work, school, college etc. if you live locally. 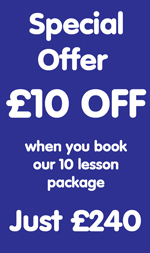 We have a high pass rate and offer high quality driving lessons 7 days a week which are tailored to each individual pupil so you know you will be taught at a pace that best suits yourself. Our driving lessons are always friendly and reliable and we specialise in nervous pupils. It is not only new drivers that can benefit from driving lessons with us, our qualified driving instructors also offer Pass Plus, Motorway and Refresher Courses for those who are already qualified but want to improve their skills and confidence. So whatever your driving ability and experience, why not call today to find out what we can do for you?